That Business Show kicks off week 14 today on 1250 WHNZ. Thanks to all my show supporters and remember to tune in each weekday at 8am and you can listen anywhere in the world via the iHeart Media app on your smart phone or online at http://www.tampabayradio.com! 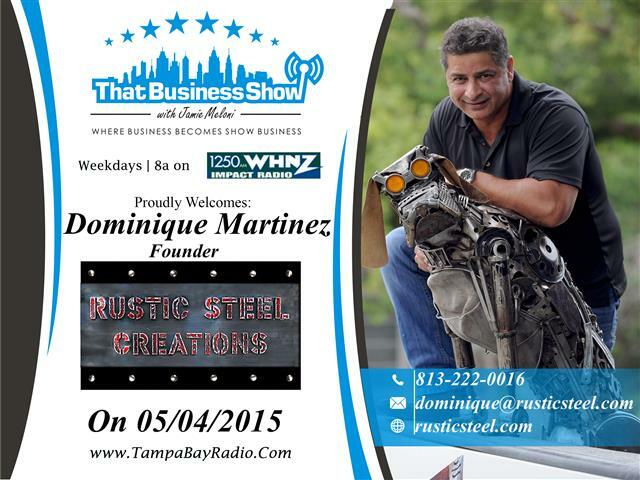 On the first half of the show today, I welcomed Dominique Martinez, Founder of Rustic Steel Creations. If you’ve driven around the Tampa Bay area much, you have probably seen some large and creative metal designs depicting various animals and figures. These artistic designs are the result of Dominique’s business, Rustic Steel Creations. You’ll find the hockey player out front of the Amalie Arena, and a dragon stretched across the roof of an Asian restaurant on Kennedy Blvd and I’ve seen many outside different businesses as I coast down Florida Avenue each morning. Dominique started this business 13 years ago and this is truly in a class all by itself. His work can also be found inside the Oxford Exchange (railings work) as well as the gear work found on the doors of the Ulele Restaurant along Riverwalk in Downtown Tampa. Dominique’s company is unique because he allows his team of artists to inimitable creations that are only limited by the artist’s imaginations. Located at MLK Blvd and Florida Ave in Tampa, Rustic Steel Creations offers welding classes to people that are interested in this craft as well and no experience is required. Learn more at http://www.rusticsteel.com and you can contact Dominique Martinez directly at 813-222-0016 or email at Dominique@rusticsteel.com! On the 2nd half of the show, I welcomed back Sarah Asaftei. Sarah is a local entrepreneur and branding strategist that creates story-driven campaigns for foundations and companies who are making massive social impact. Today she was in studio to discuss a different topic, one of which she is deeply involved in personally and wants to raise awareness for others around the community. Project 143 was started in 2010 in an effort to assist orphaned children from the Ukraine. In less than 5 years, this non-profit has grown into one of the largest and most respected orphan hosting programs operating in America and they have since added Chinese and Ethiopian orphaned children to the program. Sarah and her family have hosted and are now in the adoption phase of a child from the Ukraine and she shared her story and experience in the program with us on air today and is asking others in the area to consider hosting a child or donating to the organization. Also people can assist just by sharing and spreading the word on the needs of the organization. We discussed the issues associated with displaced orphans as many end up in prostitution, jail or in human trafficking circles as well as fall victim to suicides. Please help support this organization by visiting http://www.p143.org and making a donation today. There is no minimum contribution and you will be making a difference in the lives of someone else. I contributed $100 myself so please consider donating. Feel free to contact Sarah at 478-361-7973 or email at sarah@skamediaproductions.com for more information!